This forsythia plant used to reside on the side of my front porch. It was growing behind a large spiraea shrub, which often made that corner of the yard look messy. It’s long branches drooped over the spiraea and looked unruly. 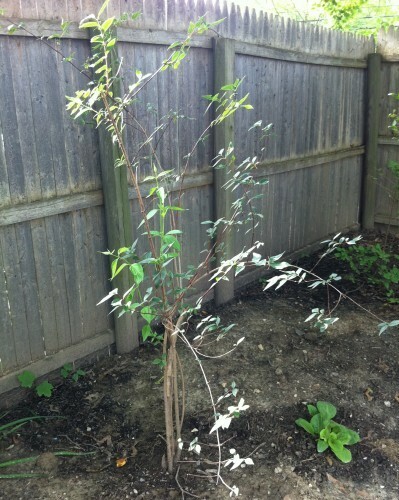 I hacked the forsythia down a few times, but it kept coming back. When I decided to grow hops up the trellis of the porch, I decided that it was time to dig the forsythia up completely. It was very difficult to get to the roots because they were underneath the porch floor. I thought we killed the poor plant off in the process. I didn’t much care because I have not been a fan of this plant from the beginning. Still, I decided to move it to a vacant space in my backyard. I spent very little time transplanting it, even managed to put the plant in at a strange angle. I watered it, and moved on. Over the summer, I kept watering it and watched it slowly rebound. As it began growing leaves, I noticed it more and more. I’d think, “Well, aren’t you a spunky, little thing?” I liked how the branches were starting to take on a weeping form. I decided that I might actually like this plant and did a little bit of research. They are very popular in New York, as the forsythia is one of the first flowering shrubs of spring, the fountain-like stems become coated with bright yellow flowers. It is a great plant to cut branches from in late winter to force blooms inside. I can attest that by late March, color is extremely welcome. I think the problem I had with my forsythia shrub is that it was in the wrong place. Gardens are much like any other room in your house. They require editing and updating. Often, I will look at a piece of furniture or artwork in one room and it won’t look right to me. I will consider donating or throwing it away. Then, I will move it to another room and suddenly it falls into place. I think people hesitate moving plants or digging them up because it can be intimidating and somehow feels all or nothing. In the case of my forsythia, I truly thought I just hated the plant. I couldn’t understand why I saw so many at the garden stores. Now that I’ve found a place in my yard where it can stand out, I am eagerly awaiting its spring show. I intend to keep it pruned because I like it in its more contained form. Although, it is now in a space where it has more room to fountain so we’ll see. It’s funny to me that a plant that was very close to being tossed in the compost, shall now be referred to as the shrub who charmed me. Awe what a happy tale. Eager to see pictures of it in the spring! We have two forsythia in our yard (only I didn’t know what they were called until reading this!) and we’ve moved them twice and they’ve both thrived. And like you I didn’t really care if they made it or not, until the first spring when they were both bright yellow and so pretty! Now I look forward to them blooming every year.